Leading Gubernatorial Aspirant in Imo State under the Peoples Democratic Party, Hon. 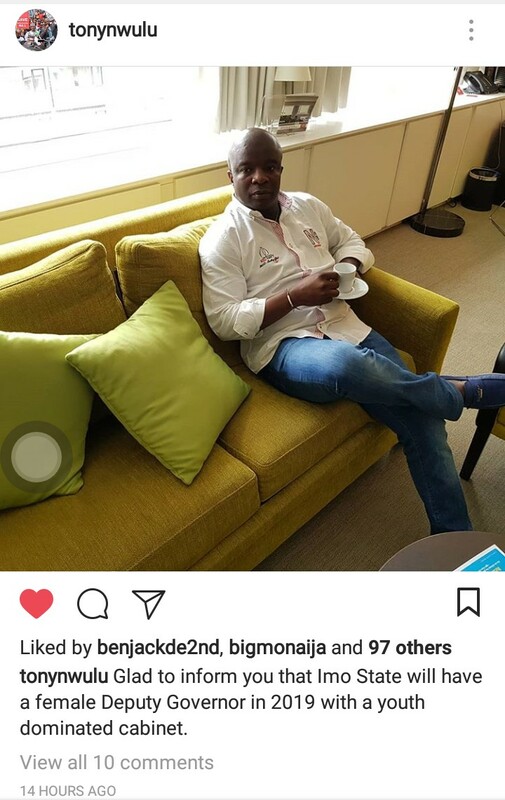 Tony Nwulu has taken to his Instagram page to unveil some of his plan for the state. According to him, He has decided to pick a female as his running mate and also appoint youths as majority in his cabinet. The Mbaise Born Politician, Hon Tony Nwulu probably have listened to the cry of Imo women over the non existence of them in high ranked leadership position in the state. 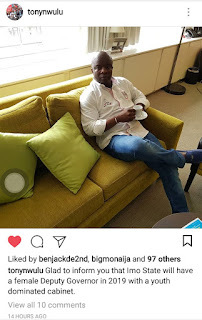 This is coming at a time the Not Too Young To Run Sponsor, Tony Nwulu, whose love for the youths is next to none was reportedly endorsed by Imo Youths to run for the governorship seat, According to the youth group, their conclusions for backing Nwulu, was that he is "an astute administrator. Also, they described Nwulu, as a competent, passionate and a visionary leader that has the political will to take Imo state, to the next level of inclusive governance."